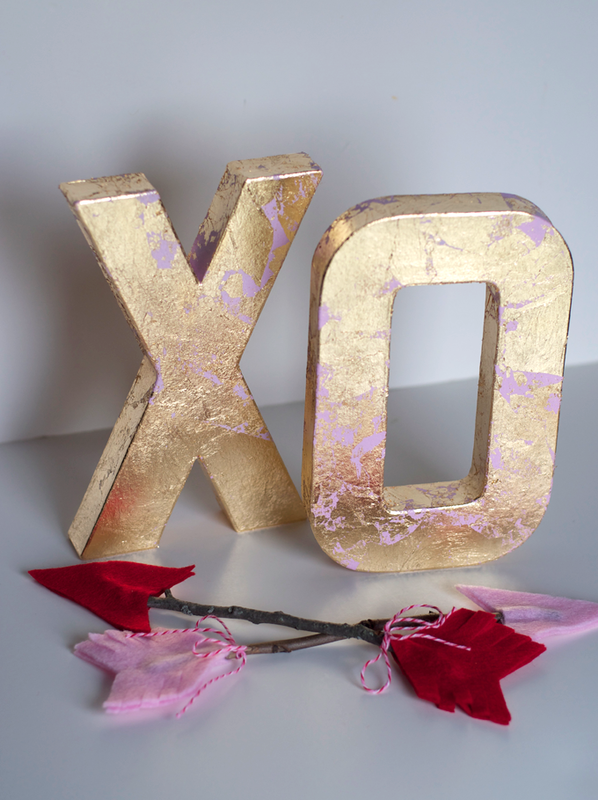 Who is ready for a little gold XO in their life? Just in time for Valentines day too. 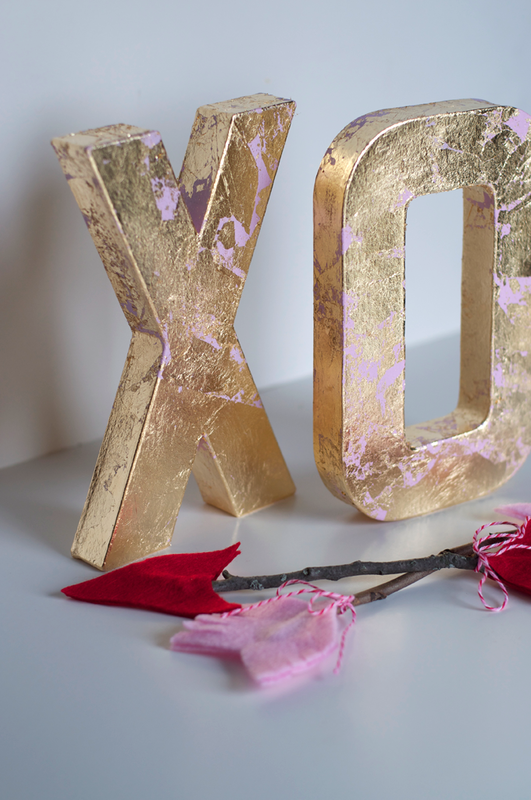 Today I am sharing this easy DIY for your home or loved one for Valentines this year. 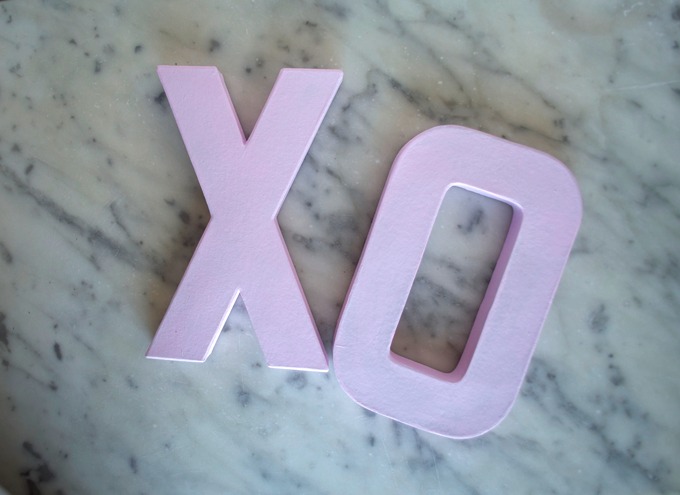 Paint your letters and let dry. 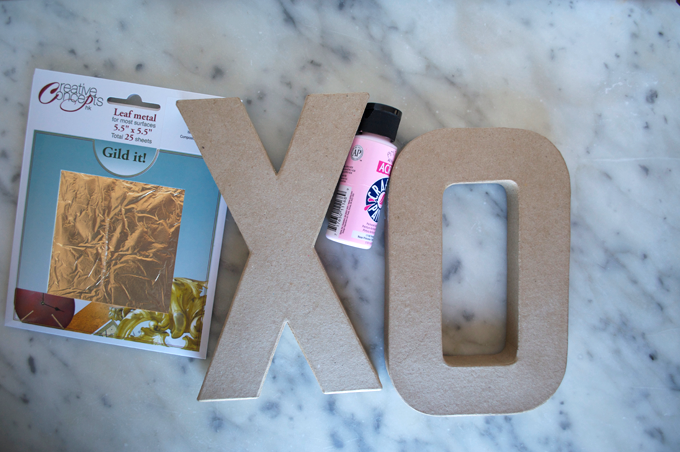 This doesn't take very long if you are using cardboard letters as they are porous and dry rapidly. I applied two coats of paint. Follow the directions on your spray adhesive and use in a well ventilated, outside, free of wind location. In other words, I wouldn't use my garage because and overage will fall to the floor and them you have a sticky mess all over the floor. If you spray it and the wind picks it up you become a sticky mess. Just spray with caution. I wanted to be able to hold my letters as I worked so I sprayed only half of the letters at a time. Work on wax paper so your letters do not stick to your work area with your surrounding area covered with paper. I'm not going to lie... it can be messy working with gold leafing! Use gloves to touch the sheets of leafing. Your body oils and warmth of your hands will make the gold stick to you and them you might as well have just stood down wind to the adhesive... lol! Place sections of the leafing randomly overlapping some and leaving spaces on other areas. I wanted the pink to show though. Then use your paint brush to lightly brush the leafing down into place and move it around to reach your desired coverage. The brush will pick up some of the adhesive so try to keep it only on the gold as much as possible. 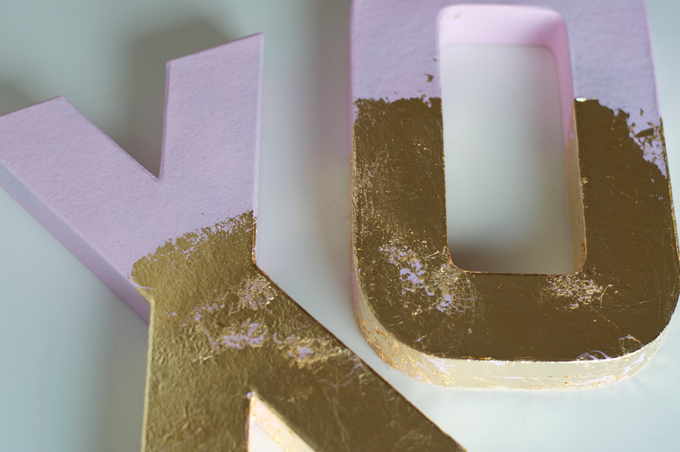 Once you have your letters covered to your liking, then use the fan brush to remove the excess gold overlap and edges. Spray the second half of your letters and repeat this step. Lay them to set and dry on wax paper for at least 24 hours and seal with a clear sealant. Glossy Mod Podge works fine. Let me know if you make these and share a picture with me. I would love to see how yours turns out! Oh and those cute arrows... I will show you how I made those next week. Thanks. It's a mess working with golf leaf, but so worth it in the end. Thanks for stopping by.